The view from the top of Lubeck Ridge. Lubeck Ridge (as the sun starts to set) from the driveway of our house. It is 2:45 PM on January 28th – the day before the birthday of my Best Girl for the past 38 years. The temperature is nine degrees Fahrenheit (9 F) and sunny. The snows of December and January have covered the region with anywhere between 130 – 185 percent of normal precipitation for this time year. I have determined these Baby’s [sic., mountains, peaks, bowls, ridge-lines] need to be skied. Kyle skins up Baldy and Dollar Mountains after the lifts close during the week. Recently, I have joined Kyle and Merry [Christmas] Dog (in her booties) on these ventures. 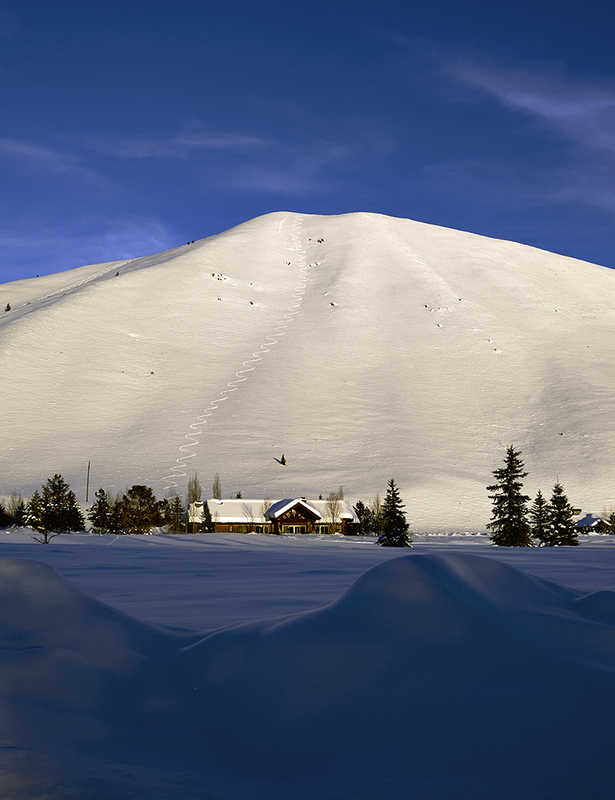 Last Friday we did Baldy and skied down in the dark – with our headlamps providing assistance. Last Sunday, Kyle and I and climbed up Proctor Mountain and skied down under a founding member of America’s original ski lifts. Separately, I have been climbing and skiing in the Sawtooths – virtually unencumbered. On this day however, the goal is to climb (in skins) to the very top of Lubeck Ridge and ski down the mountain all the way back to the house. Kyle and I had the pleasure of completing this task last winter. On that occasion we reached the top at sunset, took in the wonderful pinks and oranges of the darkening skyline and skied down in the dark through a series of fog bank layers. It was an experience unlike any other. On this trip it will be me on my own. I check the condition of the snow at various points on the trip to the top. The Avalanche Center report indicates that where I am heading conditions for an avalanche are moderate. Given the majority of the run is between 30-32 degrees in angle, I feel I can ski alone as long as I pay attention to the condition of the snow. I will pay extra attention in the two sections of the run where the pitch will be 35-45 degrees and both have large boulders protruding through the snow. As always I have my Spot GPS to report my status from start-to-finish. Normally the ascent follows our hiking route up from behind the Ohio Gulch Transfer Station. While not a formal trail, the Lubeck’s have been burnishing a Citizen’s Trail since moving to the Valley Club in 2003. The elk, deer and to some extent sheep have performed the foundational engineering. However, today I decide to head up the spine of the Mountain from the Gun Club. To ensure I am not starting out with flawed judgement, Linda takes the 2 minute drive to the spot with me and drops me off given the Green Light. It is a great choice, and as I frequently say – better to be lucky than good! On the ascent, the snow proves to be very lite and stable. Once on the upper ridges, the snow shows the effect of wind and is slightly packed. The only trace of living creatures are those of Coyote. I use these tracks for the last 150+ vertical to the top. The top of Lubeck ridge has a small cornice – with 3 foot drop down to the route I will take. Luckily the first 50 feet of the route has gentle 10 degree angle. So, think of it as jumping off the kitchen counter top onto the kitchen floor. Before I change from climbing to skiing mode, I send an “Okay” signal from the SPOT device to Linda and Kyle. Next, I ratchet down my boots two levels and flip the back part of the boot from walking to skiing mode. This is followed by removing the skins from my skis and packing them into a back-pack. And finally I change the bindings from cross-country to downhill mode and step into the bindings ready for a downhill run. The biggest challenge (for me at least) is taking the time and having the patience to adjust to downhill mode. In short I need to not rush things as the skis are now super fast and my heel is completely locked in. I also need to compensate for a heavy pack on my back (i.e., camera, lenses, monopod, shovel, crampons, water, food, headlamp, and extra clothes, gloves, googles). Now that I am all set – down I go. As I drop into the steep narrow part of the descent the snow becomes as lite and gentle as mother nature can provide. The ride is awesome. The condition of the snow remains the same for the entire descent – OMG! At the bottom of the run, there is a fence-line that acts as the point of demarcation between private property and United States Forest Service land. The wire of the fence sits about four feet high and the fence posts top out a six and a half feet in height. No evidence of the fence exists – so I ski onward. Once at the bottom I ski to the driveway of one of our neighbors. I change ski mode back to cross-country. As I head back to the house another neighbor and his two dogs greet me. They join me for my return to our house. Absolutely breath taking. Wishing Richmond was closer to Hailey.